If you are new to the IBC Network, you might not be familiar with Lori Grennan, a young physician and mother of two, diagnosed with Inflammatory Breast Cancer a few years ago. If you have been with us for awhile, you will know her name and understand what an inspiration she has been to me and how important her role in the formation of The IBC Network. 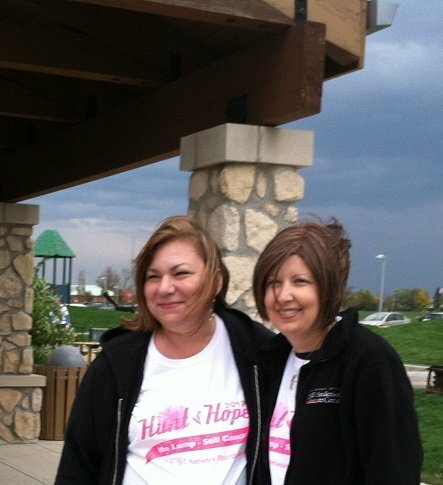 She gave me the courage to think that we could join together in a community led grassroots movement and fund Inflammatory Breast Cancer research. It was with her help, her family and her friends we raised the money to fund one study under Dr. Wendy Woodward at MD Anderson in Houston, Texas, and we plan to continue to fund research. Lori has been my inspiration, and I am honored to have her in my life as a friend. Lori is still fighting IBC. Fighting this disease in her body, and fighting by funding research. Hostess of the Hunt for Hope® in Ohio this weekend, she has encouraged everyone to join us, attend the event, donate, or just tell someone about IBC. The sign up for the Hunt this weekend is outstanding, over 200 people are expected and the rsvp list grows daily. In addition to asking people to attend the Hunt, Lori has asked her friends to donate via our website or to make out a check to The IBC Network. She wanted to see how many checks she could collect and each check received was exciting to her, each one viewed as a blow against cancer. This is where the power of one is so clearly displayed. Today a small package arrived, with a stack of checks, some as little as $8.00 and some as high as $500, for a collected total of $10,000. Wow! Can you imagine what we could do for IBC if we all had the power that Lori has shown? To go to everyone you know and ask them to make out a check to The IBC Network for just a few bucks, the research we can underwrite? We do have that power. Lori, as special as she is to all of us, has just demonstrated how easy this can be. It might be hard to fight IBC in your body, but to write a check…maybe not so hard. I am sharing this story, because what Lori is doing is not for herself, it is for all of us, so no one will ever have to face IBC because one day, we will have a cure. The power of one, to over come a fatal disease, it can work, if you join us. Lori Grennan and her son. Terry Arnold & Lori Grennan, the only picture I have of us together. I treasure it.